Railway quality benches suitable for main line or garden branch lines! 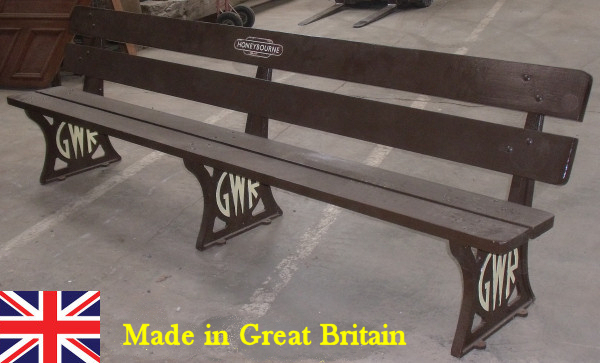 The iconic Great Western Railway bench is still in production. Fresh patterns are used to produce quality cast iron bench ends in a local English foundry. 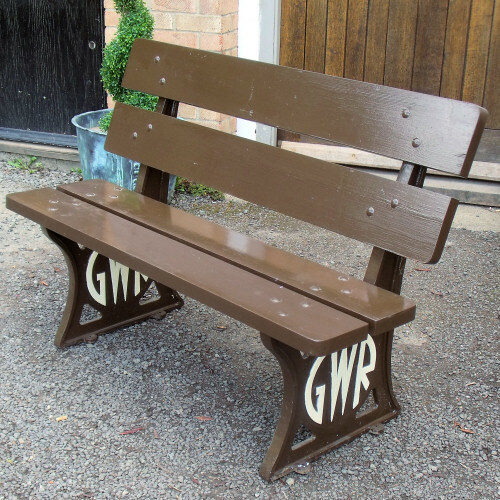 Using finest seasoned redwood for the seats, the benches are available in 3 sizes painted in traditional GWR brown and cream. Supplied to First Great Western, Arriva, Severn Valley Railtrack, Cotswold Line Preservation Group and many Historic railways throughout the UK. The benches are at home on mainline platforms as well as garden railways, pubs and restaurants and make unusual gifts for all occasions using the optional totem signs. We are pleased to quote for bench ends only, benches unpainted in kit form or benches with different timber seats. UK deliveries are made nationally by Palletline or please feel free to visit and collect. Highland and Islands destinations will incur a surcharge. USA deliveries. We have special FedEx rates for all North American despatches.Europe, Australia, Japan etc. Please call for quote. Address: Fosseway Business Park, Moreton-in-Marsh, Gloucestershire.,GL56 9NQ.